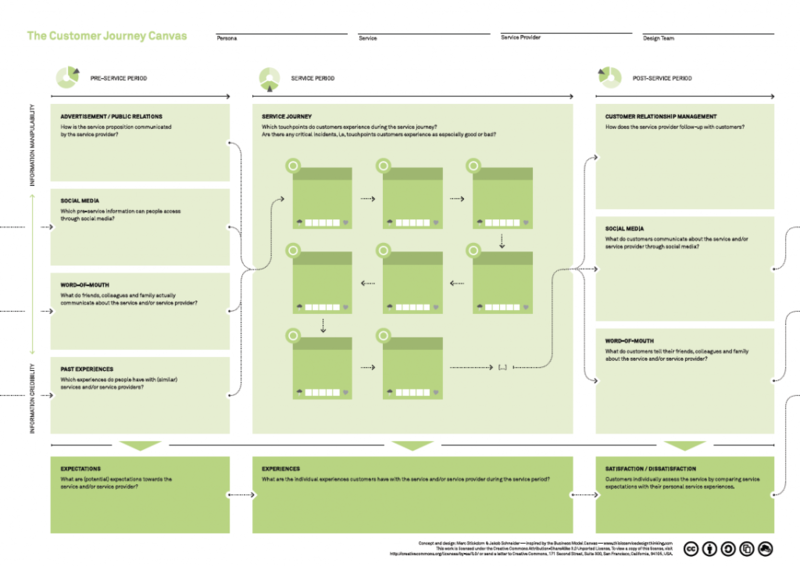 Go here to view a customer journey map video explanation and download a free template. 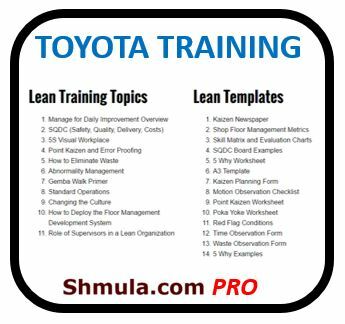 In a prior post, I discussed how most Lean practitioners focus primarily on the mechanical aspects of a process and often ignore the emotions of the customer. In other words, one can improve the process, but with complete disregard for the customer’s feelings as they go through the process. To be fair, they can be mutually exclusive. Therein lies the opportunity. In this post, I’ll explain (1) What is a Customer Journey Map, show the process of (2) Customer Experience Mapping, (3) it’s role in continuous improvement, (4) show several examples of customer journey maps, and (5) provide a free customer journey map template that you can download. What I’m arguing for is the opportunity to add the customer’s emotions in our approach to process improvement. To be clear, the processes and context for which I’m describing is relevant are processes that touch the customer – healthcare delivery, retail, customer service, and likely non-manufacturing processes. So, in Lean, there are many maps. We use a Value Stream Map, a Process Map, a Spaghetti Diagram, a Consumption Map. What all of these have in common is that they highlight the process, time, inventory levels, and the actors. 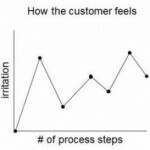 And, one key variable they all fail to take into account is the customer’s emotions as the customer walk through the process. So, what ought we do about it? Well, a map – of any type – is really just a visualization of several variables. Can’t emotion be another variable? Sure, but it’s much more. 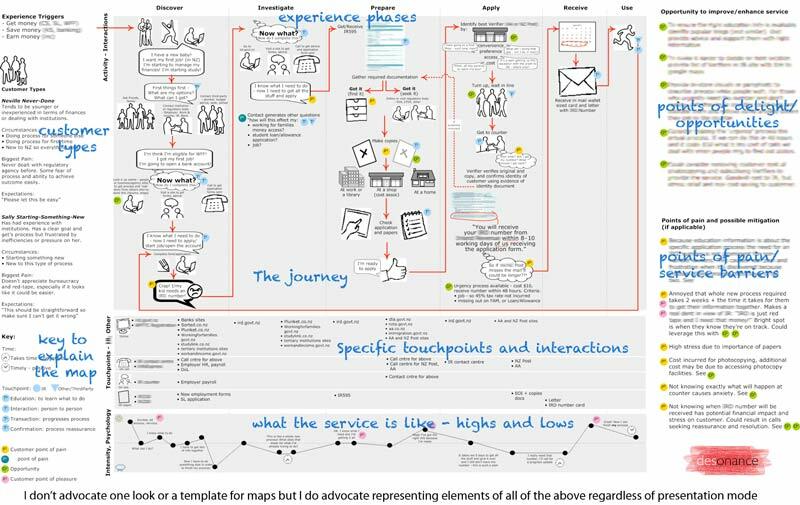 A Customer Journey Map is a document that visually illustrate customers’ processes, needs, and perceptions throughout their relationships with a company, or service(s). A “normal” map is navel gazing and self-centered, often focusing only on process and other mechanical variables. Often, customer’s needs are not represented. And, their emotions are often unarticulated in most map models. 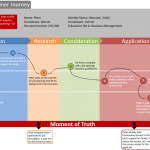 Here are a few steps that I’ve taken to effectively create an actionable Customer Journey Map. Identify all the customer touchpoints, actors, and silos. Often, this exercise is called “Touchpoint Inventory”. Synthesize current thinking from all stakeholders involved in the Customer Journey. Notice the difference? 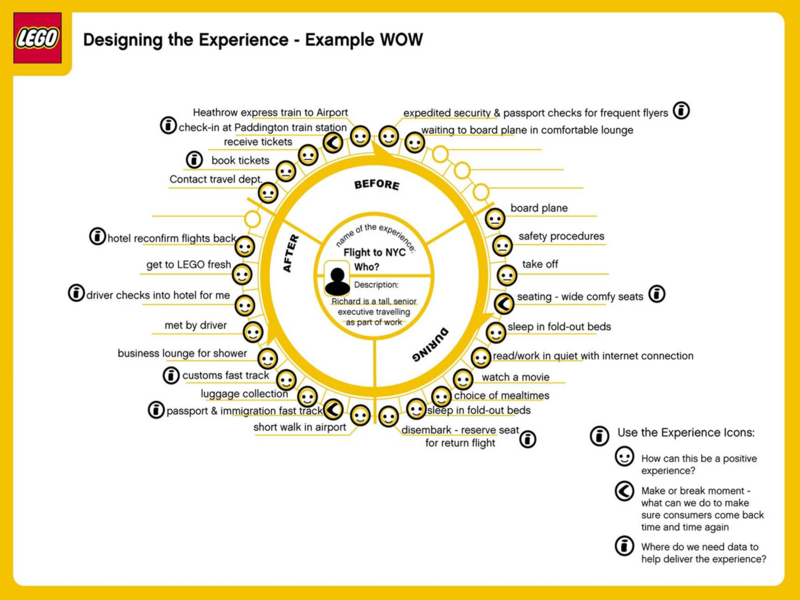 In this type of map, we’re actually highlighting the internal dialogue of the customer, and not just the process steps. This approach is much richer, but also more complicated. Needs, Perceptions, Key Moments of Truth, and Wants must be known by this point in the process. Create the Customer Journey Map. Have stakeholders review it and validate or invalidate your initial hypothesis. Gain empathy and clarity on exactly what our customers go through when they interact with our service. Identify key areas where we can improve their experience. Improving the experience is often almost dictated by their emotions. So, the key is to identify the times when the customer is feeling anxiety, unhappy, frustrated – those are signals where an improvement must be made in order to improve the customer experience. 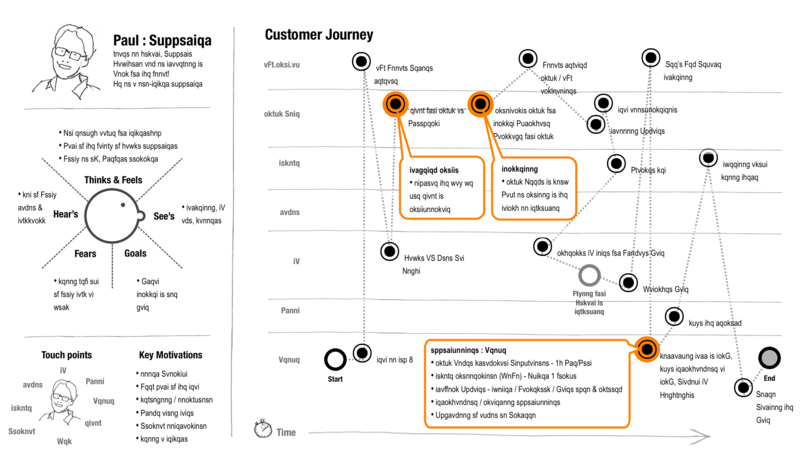 Below are several examples of Customer Journey Maps. Attribution is on the image itself. If I take a purist view, anything a customer doesn’t want or isn’t prepared to pay for is “waste” and should be minimised. Are you simply saying that when ever a customer is feeling unhappy, anxious, unsure… then that is a sign of “waste”? Which I buy. In which case having the customer explicitly involved in the mapping process is all important. After all my wife is frequently frustrated with me, but I am too thick skinned to notice it. How about a customer experience which is far from ideal in one of the sequences/steps, but is a necessary evil to improve the overall customer experience? I am talking about something like non-value adding but needed work. How would you approach this in the map? I think for process steps that are, what can be considered, non-value-add but necessary given the current state of the system, I think this approach still applies. This type of thinking can inform how we approach process steps that fall into this category. 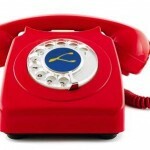 For example, If I have to repeat my name and address to a customer service agent 2x when 1x is ideal given the state of the current call center tools, the agent can provide empathy, a joke, to make things lighthearted. That approach eases the emotion, but the process still has waste. I liked the idea of having the personal touch factor. My only concern about such an approach would be on the measurability of the experience. Subjective mitigation is hard to measure and get metrics from. Perception of jokes and behaviors are pretty subjective. That’s true. This approach should be used in conjunction with quantitative methods and continuous improvement. But, including the emotional aspect of the customer experience makes the story more complete, and can inform our approach – to improve AND perhaps even delight the customer. Remember we are dealing with qualitative (preceptions). When the customer is feeling anxious, unhappy or unsure we need to look at the process and determine if the process or apart of the process is somehow contributing to the customers feelings. This is a great post – thanks! I am a huge advocate for customer journey mapping. Since more than 50% of a customer’s experience involves emotions, it’s important to understand and visualize how customers feel when they interact with your business. Customer journey mapping allows you to do this. But, the real power in customer journey mapping (if done correctly) is that it enables you to synch this qualitative, emotional feedback with quantifiable business and customer data so you can determine the ROI of all your touchpoints. Armed with this info, you can put strategic improvement plans in place, make smart decisions about where to allocate resources, and design an experience that drives value for both the customer and the company. The company I work with, Touchpoint Dashboard, has a mapping tool that helps companies do this. You might benefit from checking it out. Thanks again for the post! I would love to create one of these, but I am not a designer. 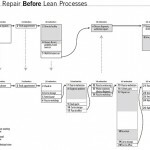 Are there any web tools like Balsamiq that can help me generate a customer journey map…with ready-widget-libararies? I don’t know of any, but they’re easy enough to create in PowerPoint. One of the commenters on this post (Jennifer, see above), mentioned a tool her company develops for customer journey mapping that you might want to take a look at. I haven’t seen it, so I can’t comment on the tool she mentions. Pete – with the customer at the center of the Experience Map and the VSM, is there a way that you have reconciled these as one view or map? Having put some time into setting in place Value Stream Maps and having them become a used and useful tool, I would like to find a way to layer these two approaches without having to have people reference two views of the impact of work on customers. Sounds like a grand unification theory, but I would appreciate your perspective. 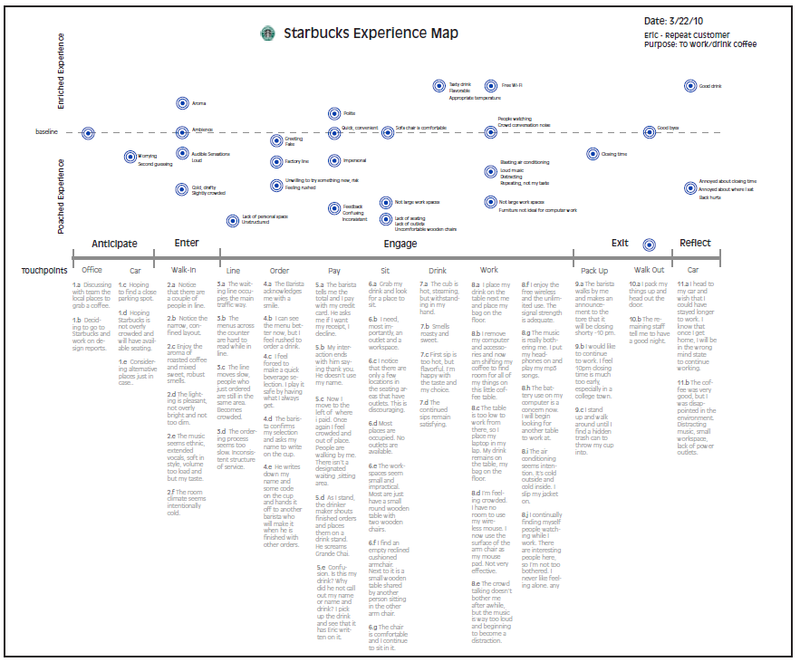 A customer journey map is really focused more on the emotional dimensions of the experience. A value stream map focuses mainly on visualizing the process and attempts to expose the 7 wastes, which are visible. On the other hand, a customer journey map attempts to highlight the processing that occurs as a customer walks through the process – this processing represents 95% of the the mental processing that is not articulated but these emotional cues influence opinion, judgment, attitudes, and feelings toward the company, product, brand, or service. I think there’s place for both approaches working side-by-side for sure. Thanks for your question and comment. I appreciate your time and attention. Very useful for capturing internal customer supplier relationships and can be an add on to a conveional value stream map rather than using a completely new template.